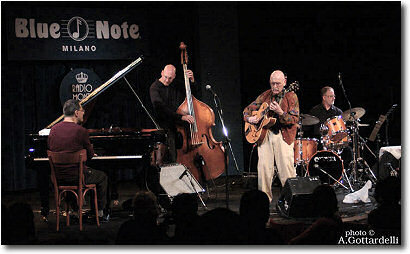 Blue Note, Milano – Tuesday September 14th, 2004 first set – 9:30 p.m. 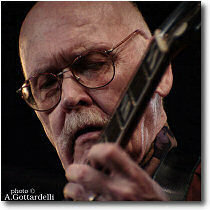 Among the greatest jazz musicians in history, Jim Hall was born in 1930 in Buffalo, and raised in New York and Ohio. Jim was first introduced to music at home by his mother who played the piano, his violin-playing grandfather and his uncle who played the guitar. When Jim was 10 years old his mother gave him a guitar for Christmas, and it was then that he began to seriously study the instrument. He enrolled at the Cleveland Institute of Music, where he continued his studies with the academic guitarist Vincente Gomez. By the age of 13 Jim had become a professional musician playing locally in Cleveland with a group consisting of an accordion, clarinet, drums, and, of course, guitar. The clarinet player turned Jim on to Benny Goodman's recording of "Solo Flight" which featured the guitar playing of Charlie Christian. "It was instant addiction", recalls Jim. 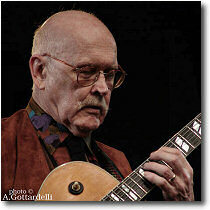 So, he was at first influenced by Charlie Christian, and later on by Django Reinhardt. After having moved to Los Angeles, in 1955 he became a member of the famous Chico Hamilton quintet, with Buddy Collette (sax), Fred Katz (cello), Carson Smith (double-bass). His refined and extremely clear approach and intimate lyrism differed quite a lot from the other guitar-players that were, at that time, taken as a model, and he became aknowledged very early for his unmistakeable originality. He collaborated for a few years (1956-59) with the band of Jimmy Giuffre (sax and clarinet) before performing in the band that accompanied jazz legend Ella Fitzgerald; he played with Lee Konitz (sax), for about two years, and then he played with Sonny Rollins. 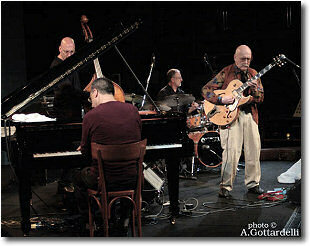 Jim Hall looks upon his experience with Sonny Rollins (1961) as a turning point in his carreer. 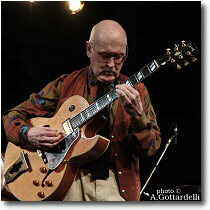 In fact, Jim Hall said that Sonny's loose and adventuresome way of playing influenced his playing. 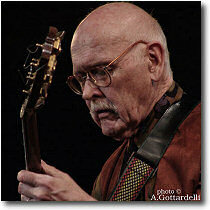 In that period, Jim Hall recorded with Sonny Rollins one of the greatest masterpieces of modern jazz, "The Bridge". In the 60's he performed intensely with Art Farmer and Paul Desmond before starting to play mainly as a band leader and free lance musician. 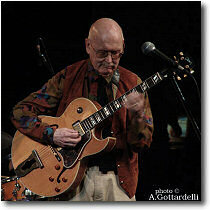 Apart from writing beautiful music for guitar and orchestra and influencing whole generations of artists, Jim Hall performed and recorded with some of the most significant and prominent artists of improvised music such as Bill Evans, Hampton Hawes, Joe Lovano, Greg Osby, New York Voices, Kenny Barron, Slide Hampton, Gunther Schuller, Ornette Coleman, Bill Frisell, Pat Metheny. 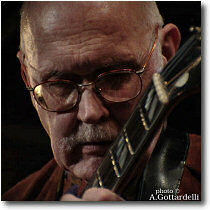 Jim Hall's Trio features Jim Hall (guitar), Scott Colley (bass), Terry Clarke (drums). 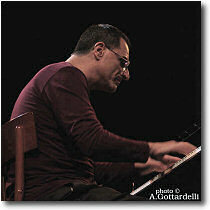 Enrico Pieranunzi is one of the most well-known and appreciated protagonists of the European jazz setting. Pianist, composer, arranger, he recorded over sixty eponimous albums ranging from piano solo to trio situations, from duos to quintets. He performed in concert or in recording studios with Chet Baker, Lee Konitz, Marc Johnson, Joey Baron, Paul Motian, Charlie Haden, and performed at some of the most important International Jazz Festivals such as Montreal, Copenhagen, Berlin, Madrid, Jerusalem. 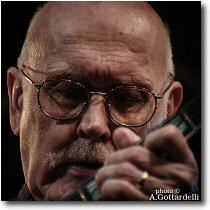 As soon as I sit at the table, which is directly below the stage, I start looking around, and I realize that a great number of Italian musicians and artists are among the audience, waiting to homage Jim Hall's playing and his music. I am sitting right between Ray Martino and Bruno de Filippi who are anxious to greet Jim Hall once again. 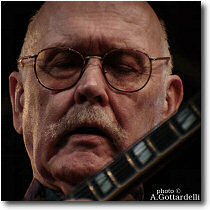 I also meet Gianni Tognoli, Adi Souza, Giovanni Monteforte (who lent his guitar to Jim Hall for the concert). Everybody is waiting quietly, whispering to one another and talking about music. 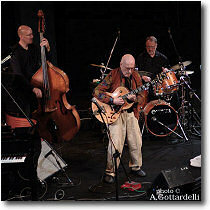 Nick the Nightfly goes on stage and introduces Jim Hall and his Trio and Enrico Pieranunzi, who start getting ready to perform. And….the magic starts right away. Everybody's silent, we are all listening, and the atmosphere becomes very intimate and soft. 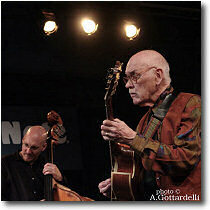 There is nothing loud about Jim Hall and his trio; and this is wonderful. The silence. Nobody speaking or chatting. 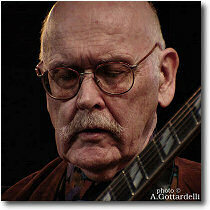 Jim Hall's playing is so smooth and soft-toned, and every single note is deliberate and meaningful. Sometimes he very softly sings along when he is improvising. 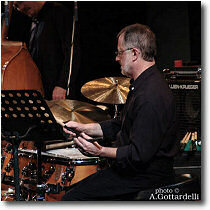 There is a beautiful interplay between the musicians, Scott Colley (bass) and Terry Clarke (drums), and there are intense moments of solo for each instrument. Enrico Pieranunzi delights the audience with his solos at the piano. I believe that for a moment we are all reminded of Bill Evans' quartet, with Enrico Pieranunzi at the piano – he who is so intimate in his playing, and such a great admirer of Bill Evans. We spend a wonderful evening experiencing Jim Hall's interpretation of well-known standards that have come to acquire a totally different flavour, an unique and recognizeable flavour, in his masterly performance: "All the things you are", "Skylark" (A. Caramichael), "St. Thomas" (Sonny Rollins) and Body And Soul (Green). 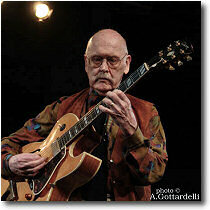 Jim Hall improvises on these very famous standards, and at first it is not easy for everybody to make out that he's playing "All the things you are" or "Body And Soul". 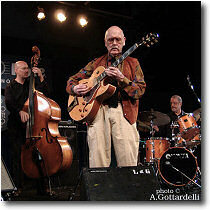 After the first piece, Jim Hall takes the microphone and thanks Blue Note's audience for their warm greeting and thanks guitar-player Giovanni Monteforte for lending him his guitar for the concert. 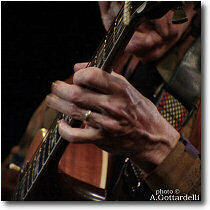 In fact Jim's guitar had been delayed somehow at the airport, and it was delivered to him just after the concert's first set, when I was interviewing him for Jazzitalia. He also talks to the audience about the importance of music in a moment like the one we are experiencing right now all over the World, and of how music can be a means of bonding people together. 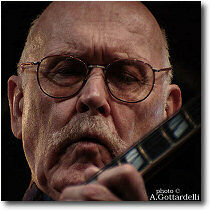 I so much agree with Terry Teachout, Wall Street Journal, that I will quote him, as his English is undoubtedly far better than mine, because this is exactly what I would have written of Jim Hall's playing if my English would have allowed me to: "His intensely intimate music gets under your skin rather than grabbing at you by the lapels…. Mr. Hall has a sound as recognizeable as the voice of a friend. 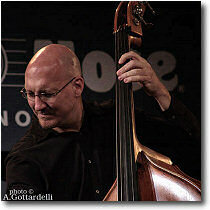 His floating, fine-grained tone is smooth and edgeless, his wide-spaced harmonies subtly oblique." The audience was also thrilled by the performance of Italian pianist, composer and arranger Enrico Pieranunzi, who also received his share of greetings and cheers from the crowd. 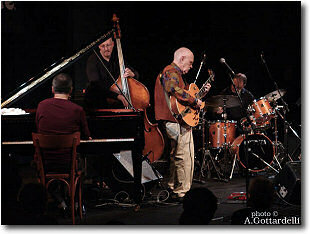 Pictures from London Jazz Festival by Thomas Van Der Aa and Nadia Guida.